Article provided by: Leonard Zehr with research from J. Ken MacDonald, David MacLeod, Ken Kowal, Ralph P. Marconi, Michael Sharpe, Carlo Alberto Pagni (ITA) and Larry Fyffe. 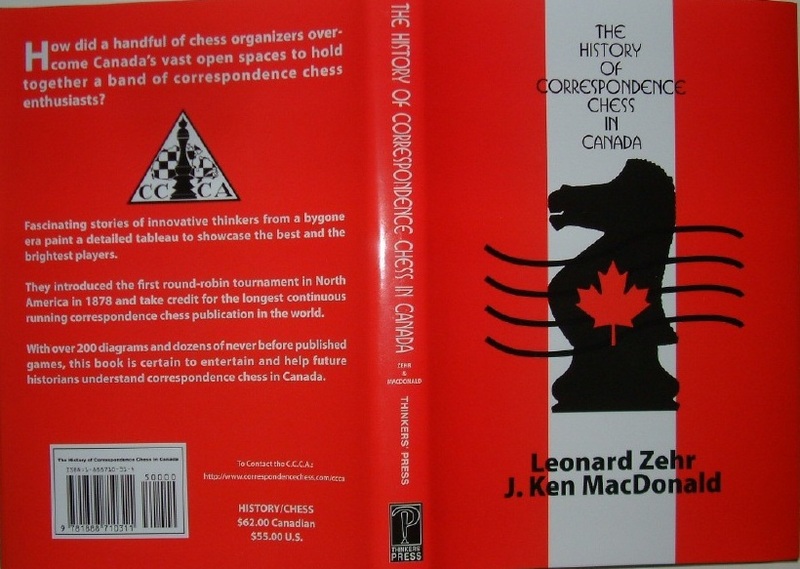 Correspondence chess in Canada has a long and noble history, tracing its roots to 1841 when the chess clubs of Kingston, Ontario, and Québec City, Québec, played a three-game CC match. Interest in chess in Canada had been sparked by the 1834 matches between La Bourdonnais and McDonnell in England, which led to the formation of the two chess clubs. The first CC tournament in Canada was organised in 1873 by Professor Cherriman of the University of Toronto. 22 players were entered in the unusual format event where most players played two games vs. three randomly selected opponents. The first prize was won by H. Robertson of Collingwood, Ontario. Professor Cherriman organised a second tournament in 1874, with 14 players, which ended in a first-place tie between John Henderson of Montréal, one of the finest CC players in North America at the time, and A. Hood of Barrie, Ontario. Henderson, who was the chess editor of The Montréal Gazette newspaper for 10 years, was also among the top finishers in the initial Canada-USA CC match arranged by Professor Cherriman in 1875, including a victory over noted U.S. chess problemist William Shinkman. In 1878, Joseph Shaw of Montréal, a future Canadian chess champion, organised the first CC tournament in the world with players contesting one game against each opponent – the forerunner of modern CC round-robin tournaments – and replacing a system of pairing players drawn by lot. With a score of 12/14, John Henderson again claimed first prize, a silver cup, in a two-year contest. Unfortunately we could not find any of his games from that event, but we find some examples of his play from a few years earlier. Here is one of his best efforts. After early difficulties in the opening, Black defends with great poise against a vigorous attack, only to falter when the worst seemed behind him. The Canadian Correspondence Chess Association, or CCCA, was founded in 1921 by E.H. Green of Winnipeg, who felt that CC would provide a form of entertainment during the long, cold winters on the Canadian Prairies when ice and snow forced many people to be shut-in. Green’s initial group, the Western Canada Correspondence Chess Club, or WCCCC, evolved from a chess column in the Winnipeg Free Press newspaper in 1918. The newspaper column, which encouraged readers interested in CC to contact Mr. Green, was instrumental in organising the club’s first event in 1919, which ended in 1921. The WCCCC wasn’t a formal club with a regular newsletter, but it communicated with members by letters and through the Winnipeg newspaper, which acted as “the club’s Official medium for notices, results and judge of play”, according to an early column. In September 1927, a new Canadian chess magazine arrived on the scene, the Canadian Chess Review. It lasted only four issues, but carried many articles about CC and the WCCCC. When the Canadian Chess Review ceased publishing after the January 1928 issue, the WCCCC adopted the CCCA name as Green and his associates moved to transform the regional club into a national body. Issue number five of the CCCA Bulletin appeared on November 24, 1928. The Bulletin was later renamed “CHECK!” and claims the distinction of being the longest running CC magazine in the world. At various times in its history, “CHECK!” has published a French-language version of the magazine or La Section Française, to reflect the bilingual makeup of Canada. One of the founding members of the CCCA was legendary ICCF IM Walter Muir of the United States, a winner of the Canadian CC championship or CCCA championship on eight occasions in the 1920s, 1930s and 1940s. One of the strongest CC players in the 1930s and 1940s was Frank Yerhoff, who won six Canadian CC titles in 1938, 1939, 1940, 1941, 1943(=1st) and 1945. Equal second for the most CCCA trophies is Arnold Lidacis, who won the title outright three times in 1956, 1957 and 1959, and was a co-winner three times in 1955, 1958 and 1962. On the international CC stage, no individual has done more to promote Canada than John Cleeve, whose death in 1995 represented an irreplaceable loss for CC in Canada. John’s name was synonymous with CC in Canada for 30 years. He was the lifeblood and driving force behind the CCCA and saved it from obscurity and extinction in 1965 when he took over as President. At the time, CCCA had 50 members and the association was going nowhere. Today, thanks to John’s drive, membership has grown to 450. John was a strong CC player in his own right, winning the Canadian CC championship in 1961 and playing in many Olympiads for Canada. 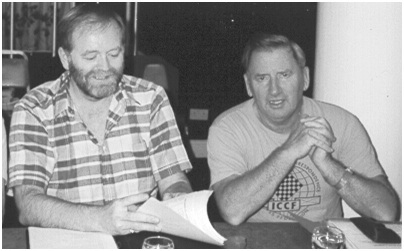 At the ICCF Congress in Nice in 1974, John was the first North American to attend an ICCF meeting. In those days, ICCF was essentially a European club. John viewed international CC as one of friendship between nations and he paved the way for North American players to enter international tournaments and win international titles. In 1987, John Cleeve received the Bertl von Massow gold medal in recognition of his service to international CC and was elected an ICCF Vice-president. Working for the ICCF, he was an International Arbiter, tournament secretary for higher-class tournaments from 1966 to 1989 and was official referee for several important international tournaments. John’s biggest desire was to see Canada do well in international CC. During his 25-year tenure as president of CCCA, four Canadians were awarded ICCF Grandmaster titles and eight Canadians obtained the title of ICCF International Master. His crowning achievement was assembling one of the strongest teams ever to represent Canada in the 11th Olympiad. Consisting of five former Canadian CC champions, the team of Jean Hébert, Jonathan Berry, John Wright, Kurt Widmann, Denis Pineault and David MacLeod won 40 of a possible 72pts in the 11th Olympiad Final. The resulting third place tie was the best showing ever for a Canadian international CC team, a fitting conclusion to John’s tireless work. Canadian teams continue to battle in regular mail and email Olympiads. As part of his passion to promote Canadians on the world stage, John organised three international tournaments on behalf of CCCA. The first, CCCA-60, celebrated the 60th anniversary of the association in 1981. While GM Erik Bang of Denmark powered his way to victory, the Canadian trio of Jonathan Berry, Bob Kiviaho and Jean Hébert all gained their GM titles in CCCA-60, a stunning accomplishment for a single country, especially since none of them owned a postal chess title when the tournament began. Overnight, Canada vaulted into a position of importance in international CC. Jonathan Berry’s book about the tournament, Diamond Dust, has received rave reviews around the world. Canada also was fortunate to be home to another outstanding OTB and CC chess organisers: Belgium native Bernard Freedman. He served as secretary-treasurer and tournament director of CCCA in the 1940s and 1950s and played a key role in keeping the association afloat. Two years after his death in 1983, CCCA organised its second international Grandmaster event, the Bernard Freedman Memorial Tournament, with an opening field of six GMs and five IMs, including former World Correspondence Chess Champion, Horst Rittner. The Canadian highlight was John Wright winning his IM title. For the 70th anniversary of CCCA in 1991, John Cleeve assembled another stellar field of five GMs and six IMs for the CCCA-70 event. Bent Sørensen of Denmark captured first place on tiebreak against GM Volker-Michael Anton of Germany and Dr. Abram Idema of the Netherlands. Both Sørensen and Idema earned GM titles while Paul Ma of Australia and Hannu Salokangas of Finland received IM titles. GM Frančsek Brglez of Slovakia, the only player to participate in both CCCA-60 and CCCA-70, improved his performance with a fourth place finish. CCCA-80 (2001-2003) was won by SIM Michele Rinesi of Italy with the best tie-break points. As a tribute to John’s wisdom, enthusiasm and devotion, the CCCA organised the John F. Cleeve Memorial Tournament in 1996, a year after his death. The category XI event, with an average rating of 2509, was won by IM Kari Tikkanen of Finland who earned the GM title for his efforts. 2nd place was taken by Dr. Manfred Nimtz of Germany and 3rd by Reijo Hiltunen of Finland (both of whom also earned GM titles for their efforts. Murray Kurtz of Canada earned the IMC title by scoring 7½/14 (cross-table available at http://tables.iccf.com/invi/Cleeve.html). 1878 to 1883 John Henderson; 1917 R.W. Worsley; 1918 Malcolm Sim; 1919 R.J.W.T. Patton; 1920 H.R. Narraway; 1921 G.E. Morency; 1922 G.E. Morency; 1923 Dr. B.N. Wales & H.R. Narraway; 1924 Lorenzo Prince; 1925 Tom Gowans; 1925 E.R. Moorehouse (CCCA); 1926 T. F. Sheedy (CCCA); 1927 K.H. Whitfíeld (CCCA); 1928 Walter Muir (CCCA); 1929 Dr. E. Bjomson (CCCA); 1930 J. Hayward (CCCA); 1931 H. Opsahl (CCCA); 1932 Walter Muir (CCCA); 1933 Walter Muir (CCCA); 1934 Walter Muir (CCCA); 1934 H. W. Jordan; 1935 Walter Muir (CCCA); 1935 Haakon Opsahl; 1936 Walter Muir (CCCA); 1936 Albert Lienert; 1937 Stanely B. Wilson (CCCA); 1937 H. Neatby; 1938 Frank Yerhoff; 1939 Walter Muir (CCCA); 1939 Frank Yerhoff; 1940 C. F. Goodman (CCCA); 1940 Frank Yerhoff; 1941 C. F. Goodman (CCCA); 1941 Frank Yerhoff; 1942 Walter Muir (CCCA); 1942 C.F. Goodman; 1943 C.F. Goodman & Frank Yerhoff; 1944 N/A; 1945 Frank Yerhoff; 1946 R.E. Martin; 1947 D.M. LeDain & H.J. Ward; 1948 S. Kitces; 1949 A. Tanguay; 1950 S. Kitces; 1951 Dr. R.M. Maclean; 1952 Dr. R.M. Maclean & Roman M. Barback; 1953 I. Poirier; 1954 S.O.Wreschner; 1955 O. Dravnieks & A. Lidacis; 1956 A. Lidacis; 1957 A. Lidacis; 1958 A. Lidacis & I. Poirier; 1959 A. Lidacis; 1960 M. Emig; 1961 John F. Cleeve; 1962 A. Lidacis & A. Cayford; 1963 F. Bohatirchuk; 1964 F. Bohatirchuk; 1965 R.C. Morris; 1966 J. Kegel; 1967 Zoltan L. Sarosy; 1968 J. Paransevicus; 1969 Zoltan L. Sarosy; 1970 Dr. Roger Kewley; 1971 Alex Siklos; 1972 John Wright & Zoltan L. Sarosy; 1973 Arthur Prystenski; 1974 Arthur Prystenski & Stephen Boyd; 1975 Stephen Boyd & Arthur Prystenski & Brian Douthwaite; 1976 John Wright; 1977 John Wright; 1978 Jonathan Berry; 1979 Robert Kiviaho; 1980 Jonathan Berry; 1981 Zoltan L. Sarosy; 1982 John Armstrong; 1983 Drew Lamb Stoll; 1984 David M. MacLeod; 1985 Kurt Widmann; 1986 Sylvain Chouinard; 1987 Francis Léveillé; 1988 Denis Pineault; 1989 Jean Pouliot; 1990 Jean Desforges & Denis Pineault; 1991 Murry Kurtz; 1992 Eric Bowie-Reed; 1993 Arthur Prystenski; 1994 Mario Adriano; 1995 Gordon Greig; 1996 Robert Bowerman; 1997 Eugene Gibney; 1998 Vince Jones; 1999 Eugene Gibney and Vince Jones. Canada crowned its first email champion, Michael McArthur, in 1999 followed by Eugene Gibney in 2000; 2001 (Email) IM Serge Dubuc and SIM Artur Mrugala; 2002 SIM Eugene Gibney (email & postal); 2003 Loving Akwei (email & postal); 2004 IM Richard Labonté; 2005 SIM Wayne Hynes; 2006 SIM Wayne Hynes; 2007 SIM Jocelyn Coté and SIM Wayne Hynes; 2008 Dan Rotaru; 2009 Dan Rotaru ; 2010 Dan Rotaru; 2011 Pino Verde. * The CCCA national championship and Canadian championship were held separately from 1925 until the early 1930s because the Canadian branch of The Chess Amateur League, an English CC league, held the rights to hold the Canadian championship. Responsibility to run the Canadian championship was transferred to the CCCA in 1933, which continued to hold separate champion-ships until 1942. In 2007 the CCCA started the CC Women’s Open Championship series. 2007 Vanessa Glover & Madge Smith; 2007 (playoff match) Vanessa Glover; 2008 Meera Sivakumar; 2009 Zsuzsanna Szamel; 2010 Sangeeta Agnes Hosea; 2011 Madge Smith. 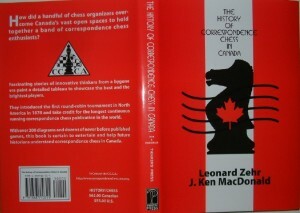 More about history of Canadian CC can be found in book “The History of Correspondence Chess in Canada” by Leonard Zehr and J. Ken MacDonald.